Ever since 1492, cultures always seem to expand westward. The phrase, “Go west, young man,” is a dare to break away from established norms and make a new destiny. Going west represents adventure, enlightenment, and pioneering spirit. Vancouver is as far west as one can go in Canada without wading into the ocean. Like all western cities, it is the end of the road for travelers who want to escape their past—or at least Canadian snow. 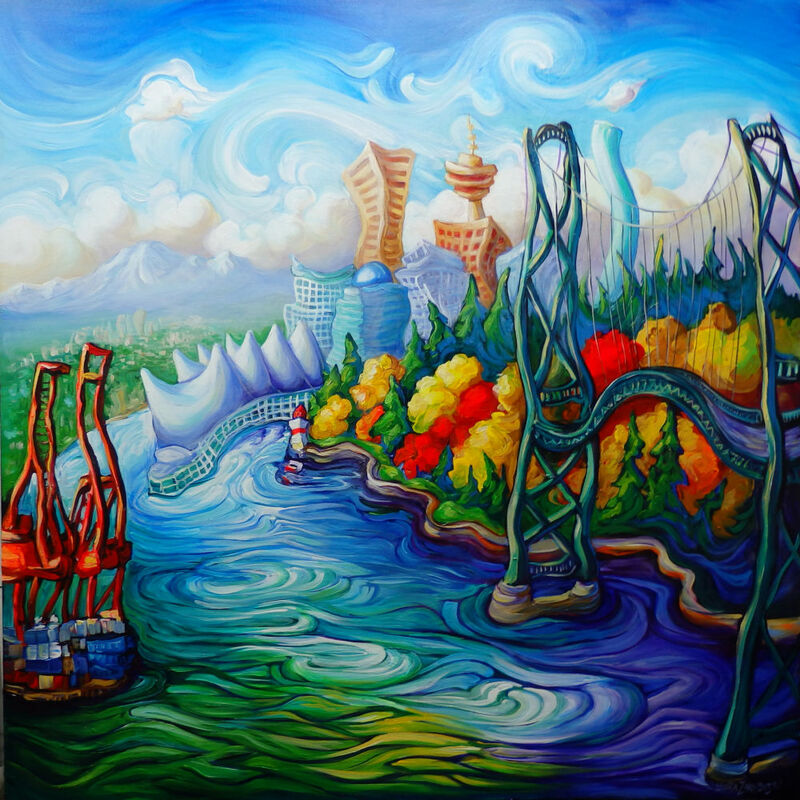 This is a painting of Burrard Inlet as imagined from North Vancouver’s waterfront industrial site. Two long-necked red harbor cranes peer west through the sinewy green Lion’s Gate Bridge against a backdrop of Stanley Park’s autumn trees. The Lion’s Gate Bridge is the last gateway before the big Pacific Ocean. Autumn is a time of change. The cranes always represent physical labour to me. Since change always takes more work than you think, this painting symbolizes the mythology of hope and change. The visual focus is on the turbulent rainbow waters, which symbolize both danger and reward. We chase rainbows because the possibility of having a dream come true is what makes life beautiful.